The Universal Repertory of Documentation (URD) is a document encyclopaedia put together on an initiative of Paul Otlet. This encyclopaedia concerned every subject and gathered every information support. Conscious that information is not only contained in books, Paul Otlet puts together this encyclopaedia that could constantly be actualised punctually. 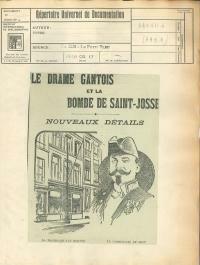 Thematic files: many of these thousand files were put together during the times of Paul Otlet and Henri La Fontaine. They are filed by subject, according to the quotations of the Universal Decimal Classification (UDC). Biographical files (around 75 000), filed alphabetically. Small geographical documents (around 1000 boxes): a whole range of documents filed by geographic location; Belgium is particularly well represented. We are currently carrying out an inventory of this collection. To consult it, please contact one of our archivists, who will orientate you in the right direction.